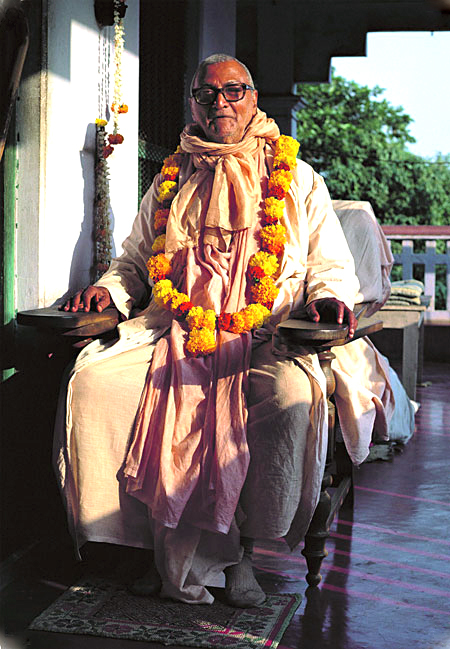 This is the greatest medicine for the devotees. We have come to measure the immeasurable, but we must always embrace this prnciple. In attempting to connect ourselves with the infinite Lord of love and beauty, we must remember that He is the infinite. He is only one to us, but He has many devotees like us to deal with. He may embrace us with much affection and adoration, but we must be prepared for the opposite. We may stick to His feet, but He may cruelly trample us. We have caught hold of His holy feet with great hope, with our whole heart; still we may find that He tramples us and does not care for all our attempts and affection. We may be giving our best and find that our offering is being hatefully dishonoured. He may embrace us, but at the same time we must be prepared that His dealings may be extremely cruel. He may trample all our offerings beneath His feet. We must be prepared for both His adoration and His hateful negligence. We should be prepared for any adverse circumstances. Krishna may be indifferent. He may not care. And when He is punishing us, He is nearer, but when He is indifferent it is even more intolerable than punishment. The devotee thinks, “Krishna is ignoring me, neglecting me so much that He does not like to keep any connection with me. Doesn’t He know me? Am I a foreigner, unknown to Him?” We may accept punishment as a boon, but indifference is even more heart-rending. The pain of separation felt by a devotee may even go a step higher. Krishna may affectionately embrace another right before our eyes, in front of our face, without caring even a little for us. We may think, “This is my claim, my right,” but that may be given to another right in front of our faces. That will be a source of increasing trouble to us. This is the law of affection. The law of love cannot tolerate indifference. It is too much to tolerate, but we must be prepared for that. We must be prepared from the beginning that this is the meaning of Krishna-prema, divine love for Krishna, because He is an autocrat. He is love. Divine love means mercy, and not justice. There is no law there. And we have selected divine love to be our highest fortune, so we must be prepared to be treated without justice. There is no justice in divine love; it is free. It may flow anywhere and everywhere. This is the very nature of divine love, so we can’t make any claim—we have no rights. This is the nature of the highest thing, and it is extremely rare. But unhesitating adherence to that principle is required from our side. It is real love, and you must be prepared for that. In all adverse circumstances, this is the real nature of Krishna-prema: die to live. If you can accomodate all these different stages, good or bad, then you can enter this exalted plane. There is a kind of small bird named chataka that only drinks rainwater. It never drinks any water from the earth, whether it is from a river, fountain, or lake. Its very nature is that with its mouth upward, it hankers after rainwater. 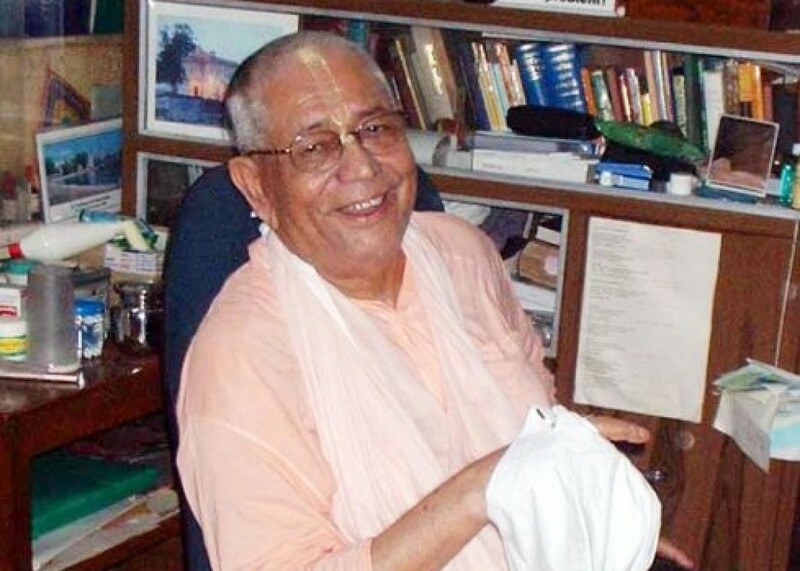 Srila Rupa Goswami gives this example to show how a devotee should always be waiting in expectation of the “rainwater” of Krishna-love, and no other love. who always has his eyes fixed upward, praying for rainwater. Rainwater may come profusely—not only enough to fill up his small belly, but enough to drown his whole body. Thunder may come from above; a bolt from the blue may come and finish his small body, and send him to the nonexistent quarter, but still the nature of that bird is to pray exclusively for rainwater. He won’t take water from any other place under any circumstance. Our attitude towards Krishna should be like that: whether or not He extends His gracious hand towards us, it is our duty to surrender unto Him. In this connection, one verse comes to my memory. When Sri Krishna met Srimati Radharani and the gopis in Kuruksetra after a long separation of perhaps a hundred years, He felt that He had commited a great crime by separating Himself from them. Approaching near the gopis, especially Srimati Radharani, and remembering their qualities of love and surrender, He felt like the greatest criminal, so much so that He bent down to touch the lotus feet of Radharani. One poet has represented the scene in this way, and that poem has been collected by Rupa Goswami in his Padyavali. Krishna was at that time the paramount king of India. But when He came in connection with the gopis and the atmosphere of Vrndavana, He felt like a criminal, and bending down, He was just about to touch the lotus feet of Radharani, when Radharani, drawing back, remarked, “What are You doing? Why are you coming to touch My feet? This is astounding. Have you lost Your mind? You are the master of everything. No explanation can be demanded of You. You are swami. You are my husband and master, and I am Your maidservant. It may be that for some time You were engaged in some other quarter, but what’s the harm in that? What is the fault in You for that? That does not matter, for that right is given to You by scripture and society. There is no crime, no sin on Your part. You have done nothing wrong. “I am the real criminal. The meanness is with Me, the defect is wholly with Me. You are not responsible for Our separation, so why do You consider that You are faulty, or that You have commited some wrong? The positive proof that I am the real crimimal is that I sustain My life; I did not die from the pangs of Your separation. This should be the ideal of our affection for Krishna. We, the finite, should take this attitude towards the infinite. At any time, He may only give a little attention to us, but we should be all-attentive towards Him. And there is no alternative. Sri Chaitanya Mahaprabhu advises that we have exclusive devotion towards Krishna, and as we are insignificant, our attitude must be of this type. If we want such a great thing, then it is not an injustice that we should be treated hatefully. Our prospect, undersanding, and adjustment must be of that self-sacrifice and self-forgetfulness, just as when someone goes to fight for his country on the battlefield, there is no room for luxury or excessive desires. I remember in this connection that when Gandhi formed his nonviolence army, one of the volunteer soldiers aksed, “Please arrange tea for us.” Gandhi told him, “The water of the river may be supplied to you, but no tea. 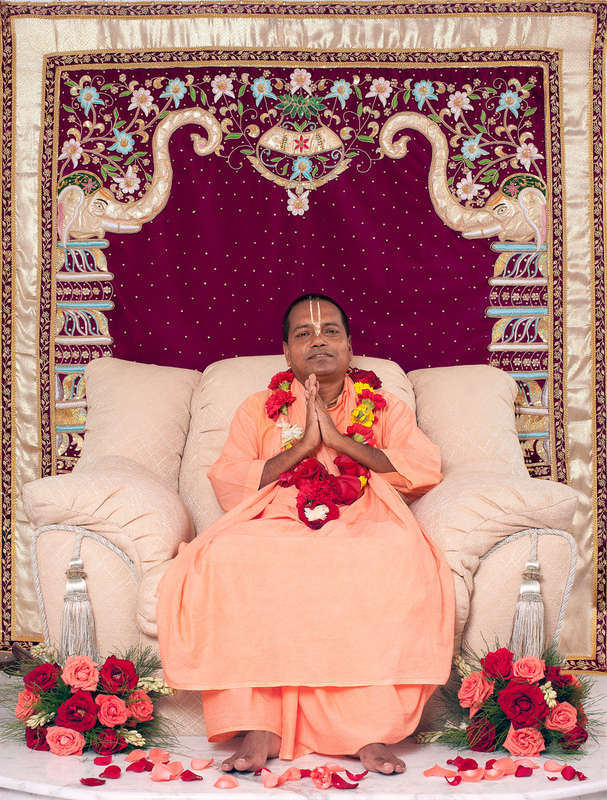 If you are ready for that then come forward.” If we want to connect ourselves with the Vrndavana-lila of Krishna, we can make no conditions. 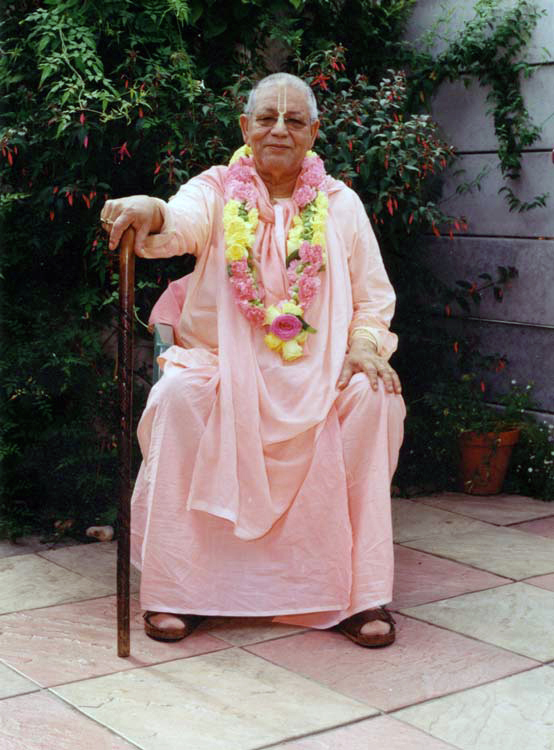 Then, we shall understand the method recommended by Sriman Mahaprabhu: humility greater than that of a blade of grass. There should be no complaint from our side. No only in the external position of our present life, but even in eternal life, any complaint from our side should be carefully eliminated and we must fully accept the ways of the Lord. Krishna may accept us or reject us; we have to take that risk. Only then may we make progress. “Don’t be afraid. Outwardly you may feel a horrible pain of separation, but internally, you will feel an unparalleled type of rasa, the most pleasing feeling of peace, joy, or ecstasy.” Externally, there may be pangs of separation, but internally there is the greatest satisfaction. When we are reading an epic where there is cruel separation between the hero and the heroine, it is so sweet to us that although we shed tears, still we cannot leave the book. When we hear about the pangs of Sita-devi, how Ramachandra banishes Her and leaves Her uncared for in the forest although She is with child, this is very painful. We shed tears, but still we read on. There is sweetness within pain. It is possible. Separation from Krishna is like that. The special characteristic of Krishna-prema is this: externally, we feel extreme pain, like lava, but internally our heart is filled with some extraordinary ecstatic joy. This is what Sri Chaitanya Mahaprabhu has given us. As much as we can catch the meaning of His instructions, we shall be prepared for that kind of life. This is the fare to go to Vrndavana, and when we are introduced to so many others like us, then our joy knows no bounds. When we meet others who have the same nature and mind as us, we get solace from them. We need not be afraid. In spite of all these things, we should think firmly that that is our home, and we should want to go back to home, back to Godhead. We are not foreigners there. Here we are foreigners: every man treats me in any way that he likes. But Vrndavana is most hopeful and full of the highest prospect. It is the place of inner satisfaction. We aspire after that; we cannot but continue aspiring for our real home. What is real joy and ecstasy? We are not acquainted with that. This is our present trouble. Yet as much as we progress in Krishna consciousness, we shall become conscious of a practical feeling of real joy and ecstasy, beauty and charm, and in this way, we shall become more and more encouraged. So if we get a slight taste of that ecstasy, then at once we come to the conclusion that there can be no comparason between that and any peace or pleasure here in this mundane world. At the same time, once we are settled in that atmosphere, no pain can disturb or affect us in any way.